Since we first got a look at its Wu-centric soundtrack, we knew the release of RZA’s The Man With The Iron Fists could mean a glorious renewal of Clan activity. And so it has been! We’ve had RZA fighting The Black Lips to the death over a fortune cookie. We’ve gotten new bangers from Ghostface and Raekwon. 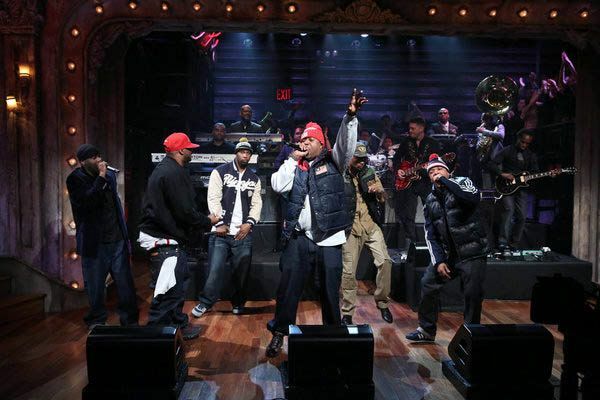 We’ve even got new hope for an actual non-lame Wu-Tang comeback! And, now, finally, we have Wu playing bubble soccer. Last night on Late Night With Jimmy Fallon, most of the Clan showed up to do Iron Fists cut “Six Directions of Boxing.” (Rae, you’re not on the track so you’re forgiven. But GZA, we hope you have a very good excuse!) And while it wasn’t necessarily a complete destruction showmanship-wise (whose idea was it to give U-God the first verse?! ), it was still heartwarming to see them out there, on national TV, mixing it up, with some serious pep in their steps. Also, Jimmy Fallon made RZA and Ghostface play bubble soccer with him and Gerard Butler. So now the big question is — can The Man With The Iron Fists: The Movie live up to The Man With The Iron Fists: The Promo Tour?